Minamiyamate, Nagasaki. 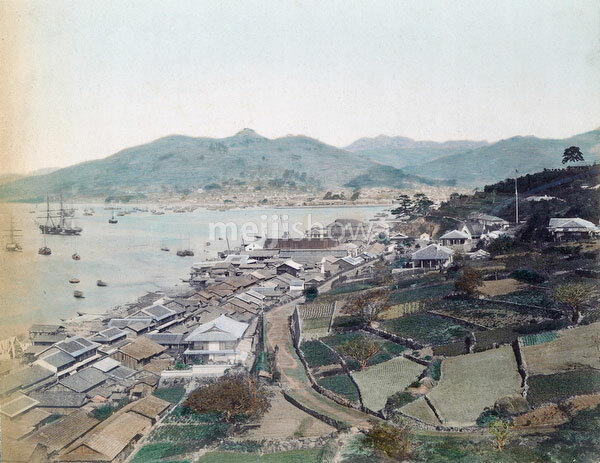 A view on Nagasaki Harbor and the southern tip of the city’s foreign settlement. The main settlement in Oura is behind the hill in the right background. The lone pine tree located on that hill marks the location of the residence of the influential Scottish merchant Thomas Blake Glover (1838-1911). The Japanese houses in the front are located in Naminohira. Another copy of this image was found among a collection of Kuichi Uchida photographs at a Berlin library; we therefore attribute it to Kuichi Uchida. It is a very rare image.